FOR MORE THAN 100 YEARS, Washington Shoe Company has been making shoes that fit people's lives. From our rugged Western Chief work boots originally built for the Alaska gold rush to our fun and fanciful rain gear for kids, we've created footwear to keep people warm and dry, comfortable and stylish, safe and secure. Built with the finest materials to demanding standards, our foot-wear fits people's needs, their pocketbooks, their lives. Our extensive line includes work boots, steel toe , hiking shoes, police and military, as well as rain and snow boots for men women and children. Though my children tend to face the inevitable change of season's with a zest that I only wish I could muster, I tend to dread the Winter, and all of the messy unpredictable weather that it brings with it. This year I'm actually bracing myself with an optimism I haven't had in the past. Why you ask? 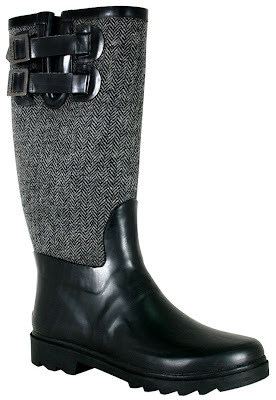 Because, this year I'm armed with some fabulous footwear that will make rainy and slushy days just another reason to break out my adorable Chooka Herringbone Boots! Heck, I may wear them on those chilly day's when the sun is shining too, yep, because they're just that cute. With the quality construction and comfortable lining, Chooka boots ensure that your tootsies remain warm, dry, and cozy, despite any inclement weather. Bring it on old man Winter! 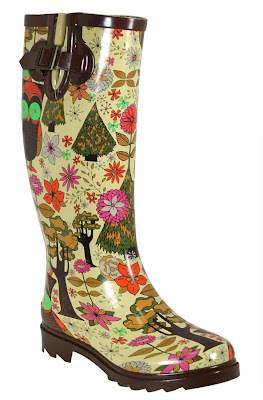 The weather will not dampen my spirits this year, my feet look way too fabulous to let that happen! Rain or Shine, face the weather fashionably this year with Chooka. Rain or Shine! Face the Weather Fashionably with Chooka! One Lucky Reader will receive a pair of Chooka Boots of their choice (RV $60)! Entry to this giveaway ends on September 18, 2011.Winner's are chosen randomly through random.org.The winner will be announced within 7 days of the giveaway ending and contacted through email. The winner will have 48 hrs. to respond or another winner will be chosen. U.S. only.